Science has shown that individuality - consciousness, self-awareness - is no longer a unique human property. That poses all kinds of challenges. The move was made at the annual meeting of the American Association for the Advancement of Science (AAAS) in Vancouver, Canada, the world's biggest science conference. It is based on years of research that has shown dolphins and whales have large, complex brains and a human-like level of self-awareness. This has led the experts to conclude that although non-human, dolphins and whales are "people" in a philosophical sense, which has far-reaching implications. Ethics expert Prof Tom White, from Loyola Marymount University, Los Angeles, author of In Defence of Dolphins: The New Moral Frontier, said dolphins were "non-human persons". "A person needs to be an individual. If individuals count, then the deliberate killing of individuals of this sort is ethically the equivalent of deliberately killing a human being. A member of a group of orcas, or killer whales, in Patagonia had a damaged jaw and could not feed. The elderly whale was fed and kept alive by its companions. Dolphins taking part in an experiment had to press one of two levers to distinguish between sounds, some of which were very similar. By pressing a third lever, they were able to tell the researchers they wanted to "pass" on a particular test because it was too hard. 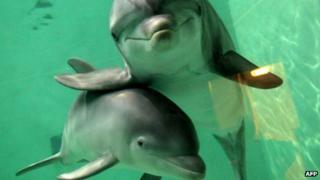 "When you place dolphins in a situation like that they respond in exactly the same way humans do," said Dr Lori Marino. "They are accessing their own minds and thinking their own thoughts." A number of captive dolphins were rewarded with fish in return for tidying up their tank. One of them ripped up a large paper bag, hid away the pieces, and presented them one at a time to get multiple rewards. In Iceland, killer whales and fishermen have been known to work together. The whales show the fishermen where to lay their nets, and in return are allowed to feed on part of the catch. Then they lead the fleet to the next fishing ground. "We're saying the science has shown that individuality - consciousness, self-awareness - is no longer a unique human property. That poses all kinds of challenges." The declaration, originally agreed in May 2010, contains the statements "every individual cetacean has the right to life", "no cetacean should be held in captivity or servitude, be subject to cruel treatment, or be removed from their natural environment", and "no cetacean is the property of any state, corporation, human group or individual". It adds: "The rights, freedoms and norms set forth in this declaration should be protected under international and domestic law." Psychologist Dr Lori Marino, from Emory University in Atlanta, told how scientific advances had changed the view of the cetacean brain. She said: "We went from seeing the dolphin/whale brain as being a giant amorphous blob that doesn't carry a lot of intelligence and complexity to not only being an enormous brain but an enormous brain with an enormous amount of complexity, and a complexity that rivals our own." Dolphins had a sense of self which could be tested by the way they recognise themselves in mirrors, she added. "When you get up in the morning and look in the mirror and know that's you, you have a sense of 'you'," said Dr Marino. "They have a similar sense. They can look in a mirror and say, 'Hey, that's me'." Whaling: Voting, yes or no? Whales and dolphins - 'resource' or 'right'?